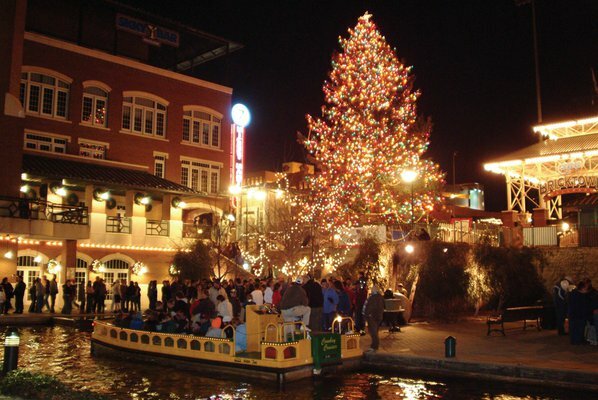 The Bricktown Canal is all decked out in stunning Christmas lights for the Downtown in December holiday celebration each year. Take a ride on the water taxis and tour the well-decorated Bricktown Entertainment District in downtown Oklahoma City. A perfect season for wooly scarves, day trips with the family and bright holiday light displays, winter brings cheer and laughter to the Sooner State. As Jack Frost ushers in a festive feel, Oklahoma welcomes families looking for stress-free holiday wonderment. Witness as Oklahoma City transforms into a radiant polar paradise during the city’s annual Downtown in December celebration. Bursting with a wealth of winter activities and family fun, this Oklahoma City tradition invites winter lovers to bounce from one activity to the next during an entire month of merriment. An excellent destination for the entire family, visitors to Downtown in December will delight in the city’s 10-block winter gala, which begins the day after Thanksgiving and continues through the New Year. Begin your Downtown in December adventure with a trip to the outdoor Devon Ice Rink, where revelers dash across the slick ice under the backdrop of the magnificent Myriad Botanical Gardens. Next, head to Oklahoma City’s Automobile Alley, situated on Broadway Avenue, to see more than 130,000 sparkling LED lights delicately draped across the alley’s historic buildings. Stop for a hot cup of coffee or delicious meal at one of the fine restaurants and shops that line this avenue, and then head over to the Bricktown Entertainment District to float down the Bricktown Canal aboard a water taxi. Here, you’ll experience the city’s warehouse district adorned with thousands of brilliant holiday lights from the city’s famous canal. Those who find themselves in downtown Tulsa for the holiday season are in for a real treat. The Tulsa Arts District comes alive every winter during Winterfest, which packs seasonal celebrations into over 30 days of merriment. Head downtown every Friday and Saturday night from late November to early January for free, live entertainment and a district packed with holiday décor. Hop on an old-fashioned carriage ride to see the city illuminated with holiday cheer before settling into a downtown restaurant or coffee house for a warm break. Continue your winter experience on the outdoor ice rink surrounded by towering nutcrackers and Oklahoma’s tallest Christmas tree. Standing 44 feet tall and decorated with an impressive 35,700 lights, the tree makes for the perfect photo opportunity. You’ll truly be in the midst of a winter wonderland as you skate while surrounded by Tulsa’s stunning art deco skyline outfitted with endless Christmas lights. Make time to stroll the made-in-Oklahoma holiday market for a unique gift before you leave downtown. While in Tulsa, there’s nothing like twinkling lights reflecting off the Arkansas River to put you in the holiday spirit. River Parks Authority’s River Lights illuminate the park with a dazzling display each year that can’t be missed. Walk alongside the water with the family while admiring the beautiful spectacle that will dazzle through the whole month of December. Enjoy fun-filled holidays full of festive events in Oklahoma's charming small towns. From Thanksgiving through New Year's Day, you'll find celebrations to make your holidays bright. Oklahoma's hometowns celebrate the season by lighting up the night with millions of sparkling lights and plenty of holiday cheer to share. Visit Woodward, Muskogee or Elk City to drive through dazzling Christmas light displays and light shows synchronized to your favorite holiday music. Experience one of the top 10 holiday light displays in the nation when you visit the Chickasha Festival of Light with millions of lights, horse-drawn carriage rides, hot chocolate and more to awaken your family's holiday spirit. View the full list of Oklahoma holiday light displays, festivals and events to keep the whole family entertained during the winter holiday break. Entertain visiting guests, escape the winter chill and show off the grandeur of Oklahoma’s heritage and history with a trip to a museum. Begin your tour of Oklahoma with a breathtaking visit to Oklahoma City’s National Cowboy & Western Heritage Museum. This impressive museum, which features numerous galleries detailing Western culture, the American rodeo and famous Western film stars, is the nation’s premier destination for Western history, culture and art. Invite your holiday guests to explore Oklahoma’s rich and vibrant American Indian culture at the Chickasaw Cultural Center in Sulphur and enjoy the center’s sky terrace, replica 18th century council house theater and traditional village. Guests will love being transported to another time and place as they sit around a glowing campfire and watch holograms tell Native American history through a traditional stomp dance. Holiday guests will also enjoy venturing into the Ozark Mountains to see Cherokee history and culture displayed at the Cherokee Heritage Center in Tahlequah. The state-of-the-art 1710 Cherokee Village known as Diligwa will take visitors back to early Cherokee trading days, where they will walk through Cherokee life with interpretive stations showcasing residential sites and cultural practices. The Philbrook Museum of Art in Tulsa is packed with unexpected art and artifacts ranging from an ornate mummiform coffin dating back to 300 BC to famous modern sculptures and contemporary paintings. The sprawling on-site 23-acre garden is especially impressive when illuminated with holiday lights. Visit on Thursday when the museum is open late to browse the gardens at sunset. Admission to the Philbrook also gives entry to the museum’s downtown location, where you can browse famous works by Adolph Gottlieb, Georgia O’Keeffe and Oklahoma artists in a sleek and modern Tulsa Arts District venue. When you’ve had your fill of art and history, venture off on a scenic drive north of the Tulsa metro area to Bartlesville, where the 1925 ranch retreat of oilman Frank Phillips, known as Woolaroc, awaits with an impressive art collection and one of the world’s finest collections of Colt firearms. As an added bonus, Woolaroc’s Wonderland of Lights has been entertaining families for years with more than 600,000 vivid Christmas lights and holiday displays. If you’re celebrating winter with kids, Oklahoma has the perfect prescription for cabin fever this holiday season. Round up the kids and help them burn off any pent-up holiday energy with a visit to one of the state’s popular, kid-friendly destinations. Endless fun can be found at Oklahoma City’s Science Museum Oklahoma, which features more than eight acres of hands-on science displays and the tallest spiral slide in the world. Every family member will find something to tickle their brain’s fancy, whether enjoying a stunning journey through the stars in the museum’s planetarium or watching a movie in the Dome Theater, complete with a 70-foot screen that surrounds the audience. It doesn’t have to be warm outside to get soaked at the Water-Zoo Indoor Water Park in Clinton, open year-round. With the temperature inside always a balmy 80 degrees, winter is the ideal time to head to this multi-level water playground, complete with a 600-gallon bucket soak, a lazy river, water cannons and an assortment of thrilling water slides. For an aquatic experience that doesn’t require getting wet, make your way to the Oklahoma Aquarium in Jenks to feed stingrays or let the kids pet small sharks at the aquarium’s popular touch tanks. Watch their eyes become wide with excitement as large bull sharks swim around them while in the underwater viewing tunnel. More indoor fun is available at the Sam Noble Oklahoma Museum of Natural History in Norman. Travel back four billion years and come face to face with colossal dinosaurs, gigantic bugs and ferocious reptiles throughout the 50,000 square foot showcase of Oklahoma’s prehistory. A delight for young and old alike, this museum will transport you and your family to a time before the last Ice Age. Don’t forget to ride the glass “dinovator” to look the world’s largest Apatosaurus in the eye!